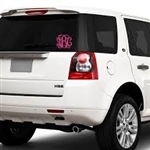 Embellish your car with this fun monogram car decal. In your choice of font and color! Decals can be safely placed anywhere on your car's exterior (paint, window or bumper), and remove cleanly and easily and leave no sticky residue. Available in 3 sizes (small = 2" H, medium = 4" H, and large = 6" H). Proportional length as determined by font and size selections.